I posted earlier some opportunity cost examples Brian Scott provided in his critique of the living wage calculations. Kiwiblog has now linked to his full published report. Brian Scott has published a critique of the so called Living Wage, and it should be compulsory reading for any politician that has treated the calculations done by Rev Waldegrave as a fit basis for public policy decisions. It is quite legitimate to have a view that wages should be higher, but to insist that the correct level is that calculated by Rev Waldegrave is a surrender to symbolism over substance. The graph below depicts the 'support ratio' for NZ over the next 46 years. The support ratio is the ratio of workers to consumers. The best way to reduce the drop is through greater immigration (the blue line) although at some point immigrants also become consumers and not workers. Increasing fertility takes women out of the workforce so produces more consumers in the short term (the green line). Whichever way you look at it by 2060 the ratio will be probably lower than ever before. And in 1960, when families produced three, four or five children, the consumers were generally less expensive than those of the future - more predominantly the elderly. Though I guess that's a debatable point. Who pays the lion's share of income tax? Could these comments apply to NZ and Australia ? The top 1 percent of U.S. earners pay nearly 40 percent of U.S. income taxes. The top 10 percent pay 70 percent. The top 50 percent pay more than 97 percent of income taxes. The poor pay nothing. Who pays income tax... and how much? ... Treasury earlier this year  estimated that this year households earning over $150,000 a year – the top 12 per cent of households by income – will pay 46 per cent of income tax. But when benefit payments, Working for Families, paid parental leave and accommodation support are taken into account, these 12 per cent of households are expected to pay 76 per cent of the net income tax. And that is before New Zealand Superannuation payments are counted. By contrast, households earning under $60,000 a year – which is half of all households – are expected to pay 11 per cent of income tax. “When we take income support payments into account, as a group they will actually pay no net income tax at all,” Mr English says. “That’s because the $2.7 billion of income tax they are expected to pay will be more than offset by the $8.1 billion they will receive in income support. So, "12 per cent of households are expected to pay 76 per cent of the net income tax" is pretty much the same as the US figure of, "The top 10 percent pay 70 percent". Notwithstanding I don't know whether the US figure applies to households or individuals. A district court judge in Florida granted summary judgment for the plaintiff in a case challenging the constitutionality of a law requiring welfare recipients to submit to drug testing. Fair enough. Making beneficiaries pass a drug test as a condition of receiving welfare is a bridge too far in my opinion. The drug-testing Work and Income conduct is on people who will be referred to jobs that require applicants to be drug-free. That's a different matter. As I've commented before the whole drug-testing issue is thorny for me, beneficiary or not. If private companies want drug-free employees that's their prerogative. However it's unrealistic to broaden the expectation to ever-increasing types of employment. And a breach of people's privacy rights...which I think is what this judge is ruling. At 15.7 percent, Pacific people have higher unemployment than Maori at 12.2 percent. Yet their reliance on benefits is low compared to Maori. At September 2013, there were 9,546 Pacific people on a Jobseeker Benefit compared to 42,277 Maori. As a percentage of all people on JS that equates to 7.5 and 33 percent. The Pacific share is roughly equal to their overall percentage of the population. The Maori share is more than double their overall percentage of the population. Looking at sole parents the pattern is repeated with 10 percent of those receiving Sole Parent Support being Pacific and 46 percent, Maori. The final benefit, Supported Living Payment, shows a similar ratio though the numbers are lower at 6 and 24 percent. Is it simply that Pacific families and communities are stronger and more supportive? Is it a matter of eligibility for benefits? Is there a shame attached to being on a benefit? My knowledge of Pacific people and their culture isn't sufficient to provide the answer but I favour the first reason. Given their self-reliance though I wonder why they vote Labour? Perhaps they don't, or won't in the future. Mr Laulu [senior Labour Party office holder] said he did not believe Labour could continue to rely on Pacific people to vote Labour "because I'm union or my parents and family have always voted Labour". The current and beloved article of faith amongst leftists is rising inequality. 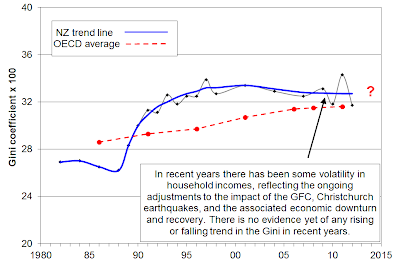 Earlier in the year I was fortunate enough to be sent a hard copy of the latest Household Incomes report by its author. Lucky because a request to MSD went unacknowledged and it's such a lengthy, comprehensive report a printed reference copy does wonders for data ease of accessibility and my good humour. Thank you Bryan Perry. Here's the graph that should accompany every press release about growing inequality. This is the official measure of inequality in New Zealand. The trend line can best be described as declining albeit slowly. "Right now the minimum wage is so low that those receiving it look upon beneficiaries with envy." If that's true, it's a major problem for the Left who look for voters from both low-income groups - workers and beneficiaries. With envy comes resentment. You might expect low income workers to feel some sympathy for beneficiaries if both groups are 'struggling'. But if the Left continue to stir and fuel bitterness about low wages, those workers might consequently feel more resentful towards beneficiaries than government. Then, when Labour and the Greens talk about lifting benefit levels specifically through paying beneficiaries the IN WORK tax credit, how are they going to react? Is that what's really behind the living wage campaign? To lift minimum wage levels up to the equivalent that (some) beneficiaries receive? The political poser for the Left is how to keep low wage workers and beneficiaries both happy with election promises. What an awful dilemma. Tasers and training are credited with a double-digit drop in assaults against police. Recorded offences against police dropped more than 20% between 2009-10 and 2012-13, figures released under the Official Information Act figures reveal. The number of infants dying suddenly has dropped but the rate is still too high, officials say. In 2012, 36 infants died of cot death or sudden unexpected death in infancy (SUDI). This is down from 55 deaths in 2008. Police Minister Anne Tolley has praised frontline Police, with recorded offences down for the third fiscal year in a row, and a massive 17.4 per cent drop in crimes in the past three years. There were 29,337 fewer recorded offences in the year to June 2013, a fall of 7.4 per cent, representing a 7.9 per cent drop per head of population. The recently-issued 2013 census results show a big fall in smoking rates since the last count in 2006. Little by little, great progress has been made...The news stories focused mainly on the overall decline in the numbers of smokers, which had fallen by nearly a quarter, from 598,000 to 463,000. That means that today only about 15 per cent of adults smoke, compared with nearly 21 per cent in 2006. ... the birth rate per 15-19 year-olds has been dropping since 2008. The general abortion rate decreased from 17.3 per 1,000 women aged 15-44 years in 2011 to 16.1 in 2012. It cemented a five-year downward trend, and the rate was the lowest since 1995, when it was also 16.1 per 1,000, Statistics New Zealand said. A record-low Labour Weekend road toll is part of a "downward trend" in deaths on New Zealand roads, police say. New Zealand's infant mortality rate - babies who die before their first birthdays - has fallen steadily from 25 for every 1000 births in the early 1950s to 4.8 for every 1000 in the Unicef data, and to 4.2 in the latest Statistics NZ figures for 2012. The drop in Maori suicide was largely accounted for by a decrease in male Maori suicide, in particular young male Maori suicide. In 2011/12 there were 94 male Maori suicides, while in 2012/13 there were 72.